You are a criminal mastermind, building up a crew to take on jobs and earn credits. The goal of the game is simple – end with the most money. On your turn, you have one of two options: Play a single card from your hand or play a set of cards out to complete a job. When you play a single cards, its special ability activates. Playing out a team is only slightly more complex. Each card is color coded. The available jobs for your crew of color requirements (ex: two blue, one red). You play a team that matches that color coding and collect that job. Jobs have bonuses that activate when completed. And, more importantly, if you collect multiples from the same set of jobs, they turn into cash at game’s end. That’s just about all there is to Grifters, an ingenious simply, but immensely satisfying card game for 2-4 players. 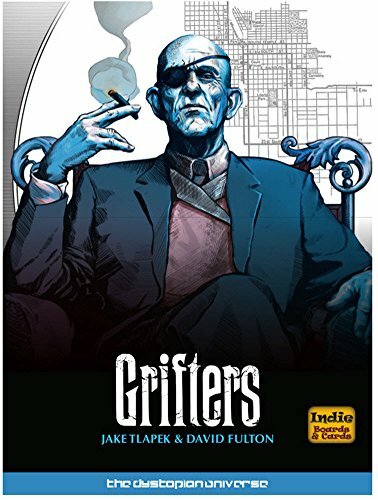 Grifters is a brilliant evolution of a deckbuilder. It takes the familiar (optimizing your available cards, deploying cards from your hand every turn) and adds sensible changes that deliver a fresh approach. There is no “deck” in this deckbuilder. Instead, all cards exist in one of three places: in your hand, played in your HQ, or in your refresh. On your turn, you first advance time. There are three night spots and all cards shift to the right one space. A card on Night 3 goes into your refresh, which means it goes into your hand at the end of your turn. No shuffling, no discard – just a continuous rotation of cards in your hand, in your HQ, and in your refresh. But you’re still trying to optimize what you have and build a solid crew with abilities that can combo off one another. I should warn that this is a massively aggro game. Players are constantly messing with one another – stealing their riches, swapping crew members, or even stealing completed jobs. This saves Grifters from feeling like some sort of gimmick-only card game. Yes, the “anti-deckbuilding” system is a gimmick, but it’s an effective one. And the constant player interaction keeps everyone engaged… and seeking revenge. Grifters is one of my favorite games of 2016. Since I picked it up at Gen Con 2016, it has always found a way into my bag when I’ve gone to game nights. It’s got high replay value, is easy to learn, and is an excellent ice breaker. It’s also set in the Dystopian universe (alongside Coup and The Resistance), if that matters to you. If it doesn’t, don’t worry, you can enjoy Grifters without knowing about those games or their shared world. Finding fun combos with cards that frustrate your enemies. Perfect graphic design makes everything immediately readable and easy to grock. Goes on just a few minutes too long. Will need an expansion with more crew members to stay fresh. Jobs don't feel as valuable as just stealing from others. You need something that’s easy to teach, quick to play, without sacrificing quality. You want to play one of the year’s best surprises.